I first spotted this amazing faucet in a movie or television show some years ago, and I was determined to find the make and model and purchase one for every bathtub and sink in the condo, even if I had to retrofit the sinks and tubs to make them work. Imagine my shock when I discovered that these taps range from $2700 to $3200 each. For taps! I couldn't believe it. 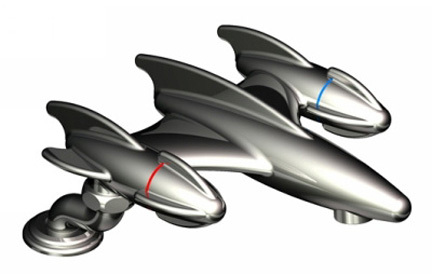 Is an affordable rocketship faucet too much to ask? Those price tags certainly signal "Taps" for my rocket taps ambitions. Wow, even that web site's design is retro. Very 1999.